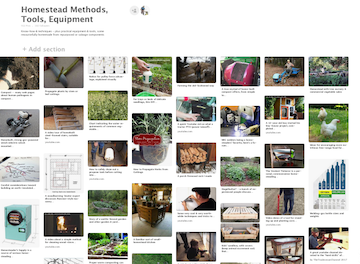 I started a Pinterest board concerned with rural "methods, tools, and equipment,” and it’s currently updated to edge toward 1000 practical-site links. The "pins" (descriptive entries with pics) link to sites explaining methods, technologies, repurposing options, and tips of potential value to small farms and to homesteads. My intent is to put forward, to interested people, links to sources of valuable information that might otherwise remain unknown to them and perhaps difficult to locate. My board is not a "wannabe's list"—I have several decades of experience working in rural environments, and I've owned and lived on rural land for a long time. Most of the items reflect (or express) my own experience. Others lie so near my experience that I feel confident in posting them and consider them "the real deal." I'll mention that the FarmHack site is one of the first pins I made to the Pinterest board. (You need a Pinterest membership to properly view the board.) I'll keep adding to the images/websites I've posted to the board as time goes on. I would also encourage others reading this to consider starting boards. It's a simple process and can broaden the exposure of information you know about and ideas you have. But you can be a member of Pinterest without starting aboard.